Car Battery Charger Review - Top 5 Choices! There are several reasons why even the best car batteries voltage can become depleted causing you to look into buying a car battery charger. Some of the most common mistakes of car owners are draining their car batteries by forgetting to turn off head lights, overhead lights or leaving doors open which also leaves the lights on. Some other reasons your car battery voltage may be decreased is due to the key-off current drain. This refers to the milliamps that that are used to keep your car’s memory alive. These “memories” are usually clocks, radio presets, and any other information your car stores for you so you don’t have to reset everything to your preferences every time you get in your car. Although these are supposed to go into “sleep” mode after about an hour or so, sometimes the relay can stick causing your battery to drain. In any case, many of the issues can cause a perfectly healthy battery to drain. With a car battery charger, you can bring your car back to life by recharging your car battery and continue to use it for a number of years. 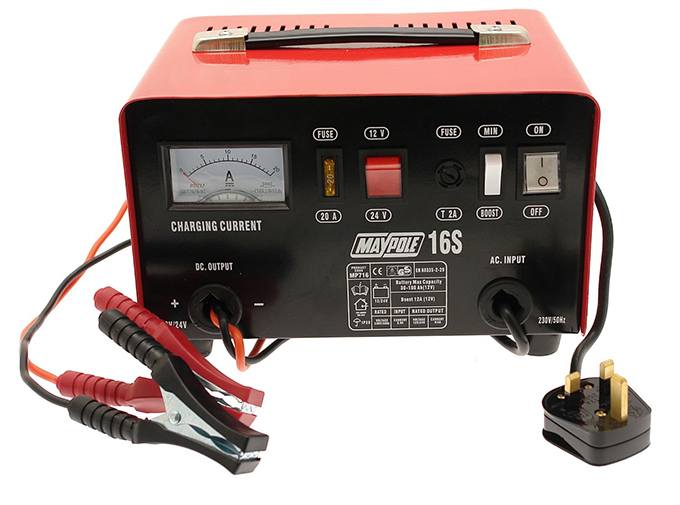 There are several characteristics you should consider before purchasing a car battery charger. The first step in determining if the charger you’re looking at is right for you is to decide how often you will be using it, where you will be using it, and what else you will need it to do. Chargers come in a variety of shapes and sizes and many are even coming out with multipurpose components for other roadside emergencies. If you are looking for a car charger to keep a car battery charged that sits idle for long periods of time or is in storage, you will want to use a small trickle charger to slowly keep the charge. If you are going to be keeping your charger in a garage and use it on a regular basis, you will want to get a roll around battery charger. It will have jump start capabilities as well as the benefits of being able to provide a trickle charge. If you aren’t mechanically inclined you may choose a portable car battery charger. These can be very small and compact and work by providing your battery with a surge of electrical current to get it to start and allows the car’s engine to recharge as it sits at an idle. In most cases, when selecting a car battery charger, you will want to go with one that has a car battery jump starter, so you don’t have to flag down a stranger, or wait for someone to come assist you in a parking lot. Some of the most popular car battery chargers were identified in a comparative study that analyzed price, slow charge rate, fast charge rate, average charge time, jump start power and warranty. Another type of car battery charger that didn’t make the top 5 list but is becoming increasingly popular is the solar car battery charger. Solar battery chargers don’t necessarily need the sunlight to work; they can also be plugged into the cigarette lighter or power socket. To use effectively, you can place the solar panels on your dashboard to absorb sunlight during the day and used as trickle chargers that provide a continuous flow of current to your battery.